In 2009, Energy Star reported that homeowners would save somewhere between $71 to $501 annually (the range for replacing single-pane windows is from $146 to $501 and for double-pane, it’s $71 to $247), but they’d also help the environment by eliminating anywhere between 692 and 3,839 pounds of carbon dioxide [source: U.S. EPA]. So, aside from the savings from window replacement, there’s an environmental pat on the back. That’s your house alone. Imagine if every resident takes the initiative of replacing their windows and entry doors in St. Louis MO? Certainly a long shot but you can be change you want the world to be – and you’re on your way with having an energy-efficient home. While on the topic of energy efficiency, we suggest getting Fibrex® replacement windows alongside new entry and patio doors in St. Louis. 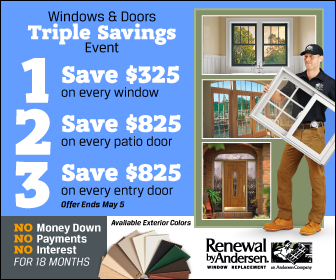 These products from Renewal by Andersen® are made to provide homeowners with better options for their house building and home improvement needs. For more information on making your home good for the environment, contact Renewal by Andersen® today.